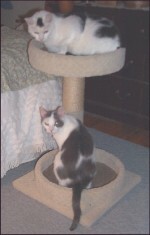 The CCM is a luxurious hangout suitable for the 1-2 cat family. They can snooze on the lofty bed, or if they're feeling frisky, or need a little claw sharpening, they can rip away at the genuine Brazilian sisal rope topped scratching post. Add optional fleece insert to fluff up the beds. Base 18" x 18." A very lovely piece, suitable for the most discriminating decor. Note: To avoid shipping delays, please select your state from the drop-down menu.